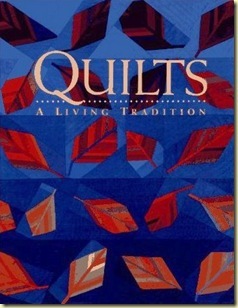 Last weekend I lugged home from the library a wonderful book; Quilts; A Living Tradition, by Robert Shaw. It was quite a task carrying it home as it weighs nearly 9 pounds! But it has been well worth the effort. It is packed full of inspiring photos and Mr. Shaw’s writing shows that he clearly understands quilts. Reading this book has led me to think about the reasons quilts are so loved by all and I have assembled the following list of reasons. 1. Quilts are touchable: Quilts represent feelings of warmth, comfort and safety. They are experienced as much through the sense of touch as they are through the sense of sight. 3. Quilts have multiple uses: Quilts are both functional and decorative. As Mr. Shaw says, “The function of the quilt allows its art to flourish, the art of the quilt allows its function to retain meaning”. 4. Quilts are revealing: Quilt makers invest a lot of themselves in their creations and those quilts reveal the personality of their maker allowing us to know the maker better. 5. Quilts create a climate of unity: Quilts made in a group setting unify the makers and can create friendships that last a lifetime. 6. Quilts can support local and national causes: Quilts can show our support, appreciation, caring and concern over causes in our lives. 7. Quilts bridge all differences: man/woman, rich/poor educated/unschooled, Northerner/Southerner, Christian/Jew, amateur/ professional; all appreciate quilts. I am sure there are many more reasons that quilts are so loved. This list only scratches the surface. But thinking about these reasons helps me to understand quilts better. that is an excellent list! well spake and thoughtful. thanks for sharing the list!